MANILA, Philippines – The October 2017 Geodetic Engineer board exam results including the full list of passers, top 10 examinees, top performing and overall performance summary of schools, among related announcements are available at this website as PRC releases the results online on October 30, 2017 or two (2) working days after the last day of board examination. As announced, 372 out of 750 passed the exams. The October 2017 Geodetic Engineer licensure exams are administered by PRC Board of Geodetic Engineering headed by its Chairman, Engr. Epifanio D. Lopez and its members, Engr. Concordio D. Zuñiga and Engr. Randolf S. Vicente on October 25-26, 2017 at PRC testing center in Manila, Cebu and Tuguegarao. According to the Commission’s Resolution No. 2016-1019 series of 2016 entitled “Schedule of Licensure Examination for Year 2017”, the target release date of October 2017 Geodetic Engineer board exam result will be in two (2) working days after the last day of board examinations or by October 30, 2017 (Monday). However, results may also be released earlier or later without prior notice. On the same exam conducted by PRC on October 2016 and October 2015, results were out after two (2) working days. The schedule of online appointment for issuance of Professional ID and Certificate of Registration will start on November 3, 2017. The two days Geodetic Engineering board exam covered topics from Laws, Rules and Regulations (includes Public Land Laws and Natural Resources, Laws on Property, Land Reform Laws, Land Registration Laws on Obligation and Contracts, Professional and Ethical Practice, Rules and Regulations Governing Land Surveying); Mathematics (including Algebra, Solid Geometry, Analytical Geometry Engineering Economics, Plane and Spherical Trigonometry, Differential and Integral Calculus, Mechanics and Least Squares); Theory and Practice of Surveying (includes Property Surveying, Isolated, Mineral & Mining Surveys, Cadastral Land Surveying, Astronomy, Route Surveys & Earthworks, Hydrographic & Topographic Surveying, Photogrammetry, Engineering Surveys and Construction Surveying); Geodesy (includes Geodetic Surveying, Geodetic Astronomy, Geodetic Triangulation, Geodetic Leveling, Gravity Measurement and Least Squares) and Cartography (includes Plotting and Mapping of Isolated, Mineral, Cadastral, Hydrographic, Photogrammetric Surveys and Map Projection). Geodetic Engineering is one of the programs with less number of examinees being administered by the Professional Regulation Commission. During October 2016 Geodetic Engineering board exams, 232 out of 555 examinees passed. University of the Philippines - Diliman was the only school in the top performing schools list having all of its 54 examinees passed. Three (3) passers shared the top spot namely Dianne Lea Lingcong Damian from Negros Oriental State University - Dumaguete, Daniel Evidente Dumlao from Saint Louis University, Vigel Demillo Ramirez from UP Diliman, all garnering 85.20% rating. On October 2015 Geodetic Engineer board exam, 179 out of 510 examinees passed. None among the schools ranked in top performing schools. Rex Reloba Doñoz from Visayas State University - Baybay topped the exam garnering 89.80% rating. He was followed by Bienvenido Gromeo Carcellar III from University of the Philippines (UP) Diliman having 87.20% and Julius Caezar Lopez Aves also from UP Diliman having 87.00%. 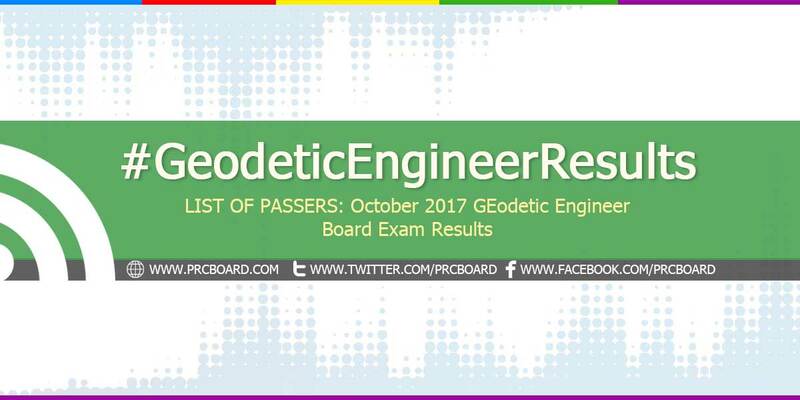 To receive up-to-date news on full results of October 2017 Geodetic Engineer board exams, we advise our visitors to bookmark this page, visit PRC official website or follow us at our social media pages via Facebook and Twitter.